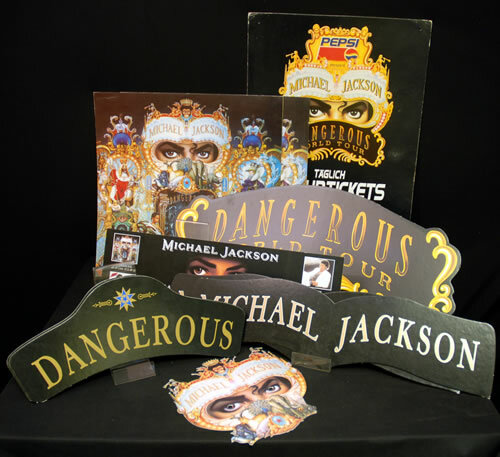 MICHAEL JACKSON Dangerous - Quantity of Ten Promotional Displays (This is a rare quantity/lot of TEN promotional only display pieces produced for the release of the Dangerous album in 1992. Scroll down for more info and check the pictures! Allare instore or promotional only items, some are duplicated. Some have staple marks where they were used instore but nonetheless remain in excellent condtion. We have header boards, display boards, a beautiful 'eye mask' and a rare board promoting ticket sales for the tour date in Germany in August 1992. A fabulous, unique set - acquired from a lifelong collector and not to be repeated! ).